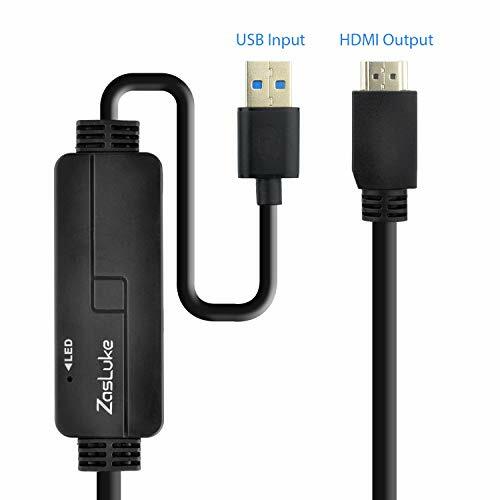 ZasLuke USB 3.0 to HDMI Adapter cable is designed for directly connection a USB-enabled devices( such as laptop, desktop) to a HDMI-enabled devices( such as monitor, projector, TV). A cost-saving double-monitor or dual-display option. No any additional USB-HDMI adapter or HDMI cables required. 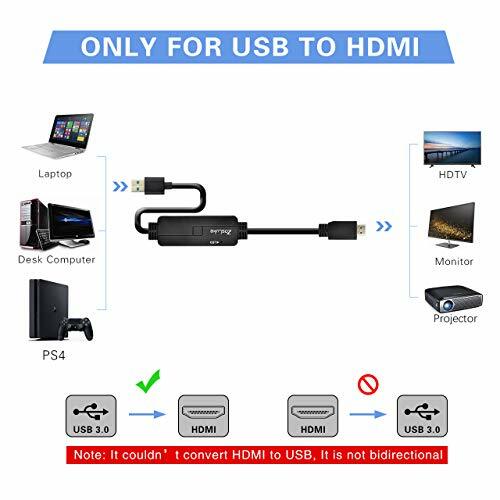 1.Connect the USB end to USB 3.0 port of your laptop/PC and the HDMI end to the HDMI on your projector. 2.Please try to install its internal driver directly. After plug it into your computer, you will find a new USB device folder in your computer, then double clicks "the computer", double clicks the "FL2000DX-2.134054.0"to install. 3. After the installation, you will be prompted to restart your computer. please plug the USB end and click "Yes" to restart the computer. 4 It takes about 6-10 seconds to mirroring from PC to TV, after you get everything ready, then you can duplicate or extend your display. 1. ONLY FROM USB-TO-HDMI Displays (TV/monitors). Can NOT be used as a VGA-to-USB converter cable. 2. Don't connect this cable to any hub or docking station, please directly connect the USB end to your computer or latptop, not to the docking station or hub. 3. If your computer have USB 2.0 port only, DON'T RECOMMEND TO BUY. It also support USB2.0 port, but for USB2.0 port the max resolution support 800*600 only. 4. Only support one additional display, Extend or mirror your workstation to another screen. One additional Monitor, so please don't use more than one USB. 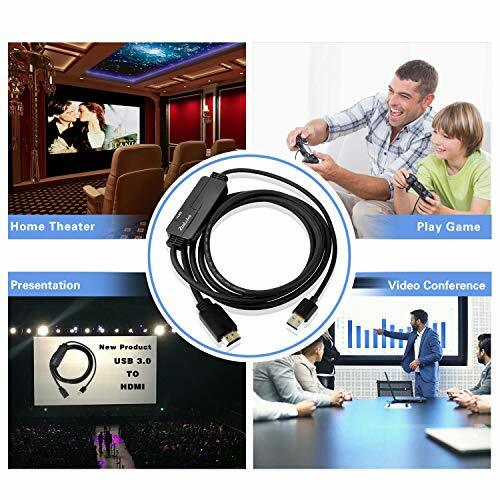 【USB to HDMI Adapter cable】 The USB to HDMI adapter connects a USB-enabled devices input ( such as laptop, desktop) to an HDTV, monitor, or projector with HDMI output; Highest performance USB graphics solution available. No any additional USB-HDMI adapters or HDMI cables required. 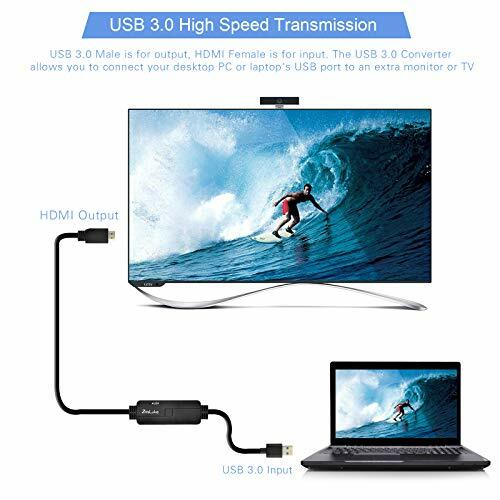 【High-Definition Graphic Images】this Volantech USB 3.0 to HDMI offer a high-definition graphic images to your HDTV or monitors at resolution up to 1920x1080@60Hz (1080P) over USB 3.0. This also support USB2.0 port, but for USB2.0 port the max resolution only 800*600. 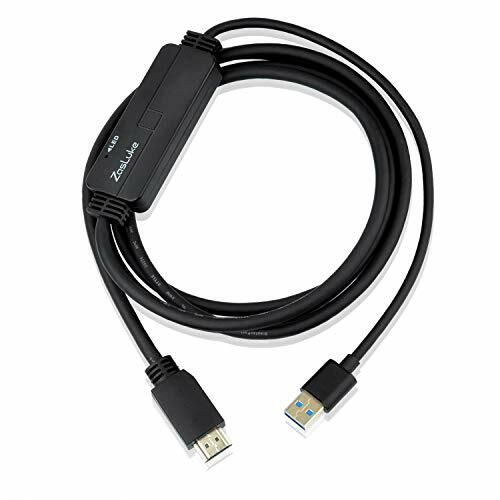 【Built-in Driver】USB 3.0 to HDMI cord is with built-in driver, no other cable needed for this HDMI to USB C Adapter. Please connect the USB end to your computer or latptop, not to the docking station or hub, install its internal driver directly. PC MUST has its own USB 3.0 port. 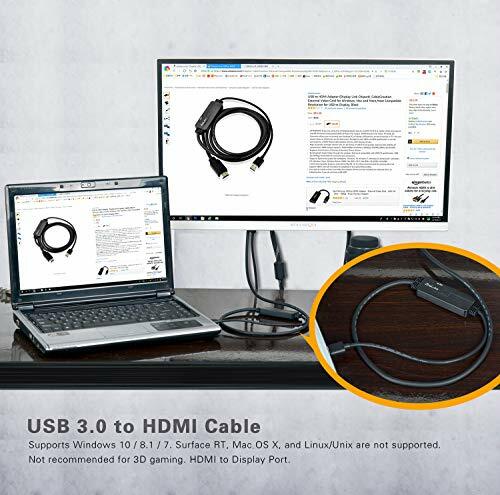 【Wide Compatibility】: PC system with an available USB port (USB 3.0 recommended); Supports Windows 10 / 8.1 / 8 / 7/Vista & Mac OS 10.11.6 and Mac OS 10.12.6 for PC, Laptop, Surface, Surface Pro etc. Note: this item did not support XP /Linux/Chrome OS. 【Five Start Customer Support】: Our products are backed with a 1-year limited warranty. If you encounter product quality problems, Please first inform us that you will be compensated within 24 hours. If you have any questions about this product by ZasLuke, contact us by completing and submitting the form below. If you are looking for a specif part number, please include it with your message.